How it works: The Conservation Overlay Districts adds zoning language specific to Krisana Park to the Denver Zoning Code. When your project is submitted to Denver Zoning/Building for review, they will check it against this part of the code (COD-5) in addition the the rest of the current Virginia Village zoning code (S-SU-DSUBURBAN - Single Unit). You can find COD-5 within Denver's overall zoning document in sections 9.4-9 - 9.4-11. Download just the COD portion from the above link or go to Denver Planning's web site to see the entire zoning code. There is no oversight committee or neighborhood review. If you are interested in the process - see below for the milestones during the neighborhood effort. Thanksgiving 2016 Update: The Overlay District passed the Planning Commission and on Monday November 21st, 2016 gained unanimous support from City Council! Both text amendments will be signed by the mayor and become law in the Denver Zoning Code this week. There has been a very large outpouring of support by the residents of Krisana Park for the Conservation Overlay District proposed by the Edison neighbors to retain the mid-century modern Eichler style of our homes by restricting homes to one and a half stories while allowing increased expansion into the backyard. 90% have signed the petition. Councilman Paul Kashmann will be taking this to the City Council this fall (2016). Detailed explanation of the updates and the same table highlighting what Denver Zoning has recommended. Here is a quick update on the progress of the Krisana Park Conservation Overlay District (COD) to help protect our Mid-Century Modern homes. With nearly 90% of Krisana Park homeowners on board, Councilman Paul Kashmann initiated The Krisana Park Conservation Overlay District (CO-5) on June 16, 2016. Kyle Dalton, Principal City Planner with Denver’s Community Planning and Development (CPD), began the process to formalize the amendments. The first step was to “Test the Text Amendment” from the petition. During this process, CPD reviewed the proposed amendments, and after a meeting with Councilman Kashmann and a few team members arrived at the following set of standards. CPD agreed with the original proposed standards and proposed an option to add the bulk plane height and slope standard to help better preserve the horizontal lines of the original homes. Changing the slope is in keeping with a maximum roof pitch 3:12—and height has a split level to the rear of the zone lot. Krisana Park block representatives who gathered the petition signatures agreed with this proposal to help keep with the intent of the petition. The standards above are the ones that will move forward through the next steps in the process. Inter-Neighborhood Cooperation should express to the Planning Board and City Council that it supports the establishment of Krisana Park Conservation District 5 because it is strongly supported by the neighborhood and it will help to conserve an important affordable mid-century modern architectural style in Denver. 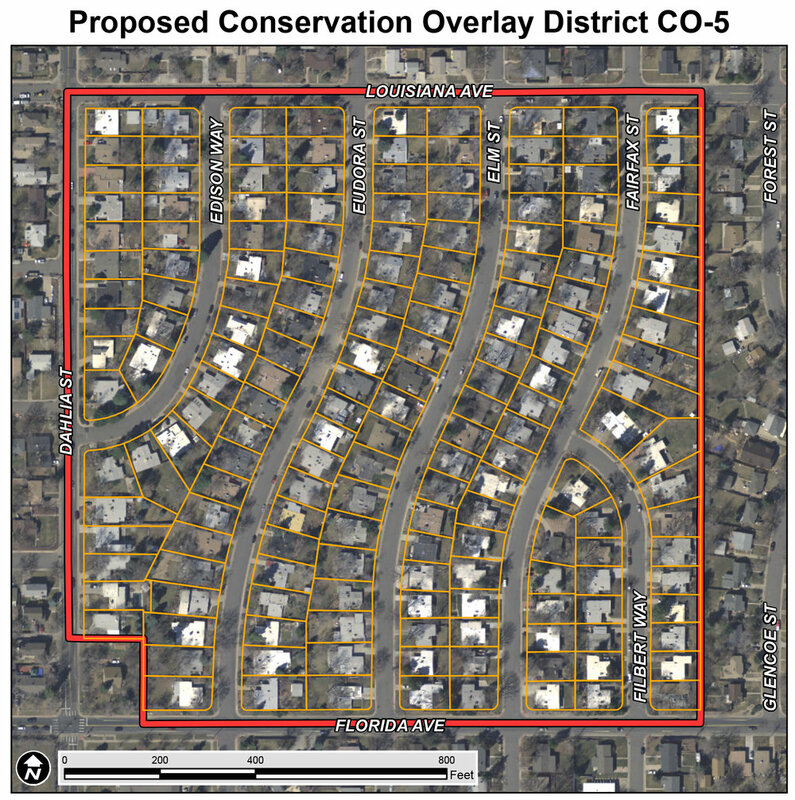 Following City Council approval, Mayor Michael Hancock must sign the Amendment for the Zoning Code Text and Map to be amended and make the Krisana Park Conservation Overlay District (CO-5) part of the Denver Zoning Code. Contact Kate Adams or Angelo Marasco if you would like further clarification or see some additional graphics that explain the changes.